The present regulations define all cars built in large or small series and recognised by the F.I.A. in categories “TOURING” and “GRAND TOURING” in compliance with provisions of Article 254 below. They compulsorily apply to all events entered on the International Sporting Code (speed events or regularity trials) or on the Calendar of National Events with foreign participation authorised and in which series production cars of the Touring and Grand Touring Categories participate. Vehicles referred to in the above article shall be distributed into the following categories and groups. in which shall be admitted all cars complying with the special regulations of Appendix “C” to the International Sporting Code as well as Touring and Grand Touring cars of a model recognised by the FIA, but which because of changes effected cannot be entered in one of the three above mentioned groups (see art, 274). Promoters are free to choose the group(s) they wish to Include in their Supplementary Regulations. Except when otherwise specified by the FIA, for a given category of events, the combination of several consecutive groups is authorised. Since the order of groups as given here-above is considered as forming a logic progression, a car which is eligible for competing in any group not provided in the Supplementary Regulations of an event is automatically eligible for competing in a higher group. 1) Cars with an engine capacity up to 400 cc. 2) Cars with an eng. Cap. Above 400 cc and inf. or equal to 500 cc. Except when otherwise specified by the F.I.A. for a given category of events, there is no obligation for the promoters to include all the above classes in their Supplementary Regulations and furthermore they remain free to combine two or more consecutive classes according to circumstances particular to their events. The above classification applies to cars with non-supercharged engines. Cars equipped with a supercharging device provided for the whole series by the manufacturer may be recognised by the F.I.A, but in one of the classes above the one they would belong to according to their nominal cylinder capacity. Before a series production car is accepted in the "Touring” or “Grand Touring’' category in a competition it has to be recognised in that category by the F.IA. Recognition of each Touring or Grand Touring model shall be requested by the National Automobile Club of its manufacturing country. Said request shall be accompanied with a certification from the ACN that the minimum production required has been met and with the technical documentation enabling the unmistakable identification of the model. Recognitions will be granted by the FIA on recommendations of a sub-Commission appointed by the CSI called “Sub-Commission on Recognitions”. They will be circulated at the earliest opportunity by the FIA Secretariat. Any change definitely brought to the series production of an existing model shall make the subject of a descriptive note giving specifications as to the exact nature of the change effected. Said note shall be established by the A.C.N. of the country where the altered vehicle has been manufactured, and submitted by the A.C.N. to the Sub-Commission on Recognitions. Should the Sub-Commission deem that the nature of the change effected is appreciably improving the performance of the vehicle, the latter will be considered as a new model and a new recognition form will be prepared. Otherwise, changes will simply be entered on a complementary form, joined to the existing recognition form, and the altered vehicle will be considered as a "variant” of the original vehicle. All Touring and Grand-Touring Cars recognised by the FIA will be described on a form, called Recognition Form drawn up by the National Automobile Club, on which will be entered the chief specifications enabling the identification of each model. A single type of recognition form drawn up by the CSI, shall be used by all A.C.N.s. After a certain date to be fixed by the FIA all competitors shall have to carry the recognition form concerning their model of car. Promoters will be entitled to refuse participation of a car in their event if said form is not produced at scrutineering. Fuel shall be of a commercial type generally distributed by road service stations, except in cases of special waivers granted by the ACNs with the consent of the CSI in favour of promoters of events taking place in countries where the quality of commercial fuel is insufficient. Upper-cylinder or two-stroke engine lubricants are authorised, on condition they do not increase the fuel octane number. Series production Touring cars are motor vehicles intended for the transportation of persons and for which the manufacturer has endeavoured to obtain the best performance in normal conditions of use. In order to enjoy recognition in the “Touring” category, these cars must be in conformity with a model well defined in a catalogue and obviously intended for normal use, “for pleasures or business”. They must be offered to customers by the regular sales department of their manufacturer. They must be of a model in current production or which has not be definitely abandoned for over four years. They must have been manufactured in series at a minimum rate of 1,000 units in 12 consecutive months and be identical as far as mechanism and coach work are concerned. By identical is meant that the external shape and the component materials of the mechanical parts, the chassis and the body must remain unchanged. To the exception of the modifications and additions explicitly authorised according to the present regulations any accessory and/or any mechanical part may only be replaced by the same accessory or the same part used by the manufacturer for the considered model, the only, tolerances in size being those officially foreseen by the factory. All elements of the vehicle must compulsorily be those of one same recognised model, whether said model is the basic one or one of its variants also recognised (see art. 254) to the exception of elements whereof the addition, the removal or the replacement is explicitly authorised according to the regulations hereafter. Series production touring cars shall have a closed body or a “convertible” body. Coachwork means all the external parts of the vehicle licked by the air streams and located above a plane passing through the wheel hubs. Convertible coachwork means a body which can be either completely closed, or open, with inter alia mobile windows in the doors. Is excluded all coachwork fitted with a simple hood offering but a scanty protection against bad weather, even if the hood is equipped with detachable side- screens. As a rule the body shall be built by the manufacturer of the chassis. However, a series production body manufactured by a coachwork builder approved by the maker of the chassis may be admitted. For cars whose body has been made outside the main factory, there will have to be at least 1,000 units assembled within a period of 12 consecutive months and said cars will be subject to a separate recognition. 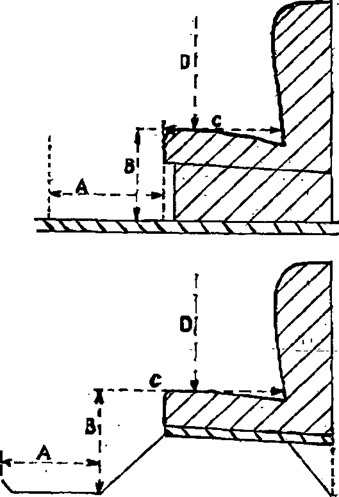 (a) is always measured horizontally and parallel to the longitudinal axis of the chassis, between two vertical planes perpendicular to the longitudinal axis and delimiting from front to rear the open space on a level with the height where such measurement is taken. For a driver seat (a) is measured at floor level, or at the bottom of any recess, from the perpendicular of the nearest pedal at rest. For a passenger seat (a) is measured at 20 cm above floor level or the bottom of recesses if need be. In the case of movable seats their position shall not be altered when measurements are taken. (b) is measured vertically from the rear end of (a) to the horizontal plane tangent to the highest part of the cushion, as shown on the sketch. (c) is measured in the horizontal plane defined above from the upper end of (b), parallel to (a) and in the centre of each seat, as far as the vertical plane perpendicular to the longitudinal axis of the chassis and tangent to the foremost point of the back of the seat. Backs of seats shall have a minimum height of 30 cm measured vertically from the rear end of (c). The minimum width for foot space for each person shall be 25 cm measured perpendicularly to the longitudinal axis of the chassis. Shall not be recognised as four-seaters, cars comprising inside the coach work 2 normal seats and a back space fitted for the transport of dogs or luggage, even if the dimensions of said space enable the occasional transport of passengers. On the other hand, and unless Supplementary Regulations of an event prescribe that all seats provided by the manufacturer must be occupied during said event, the normal disposition of seats may be subject to all kinds of modifications in leaded to improve the comfort of the occupants (transformation of the seats or their replacement by others) providing there is no reduction in the number or the comfort of the seats provided by the manufacturer. The official weight of a car shall be entered on the recognition form of the considered model. This weight shall be obtained by taking the average of the actual weighing results of 5 closed cars of the same model, selected at random and weighed in the following conditions: with the spare wheel provided by the manufacturer and with a tyre which is the same as those mounted on at least two wheels of the vehicle, with full oil tank, and full water tank (if such is the case), but without fuel, tools, luggage or anyone aboard. When the weight is being checked at scrutineering a tolerance of minus 5% as compared with the weight entered on the recognition form will be granted, whatever the cause of the reduced weight but provided it results from a lightening which is permissible according to the present regulations. (3) Air-filter; may be changed or removed. (4) Carburettors: their number, type and make must comply with those used by the manufacturer for the model considered. They must always be liable to be directly adapted on the inlet manifold but all the settings and the changes of the venturis, the jets and chokes are authorised. All tuning operations and modifications of the venturis or the jets and chokes are authorised, even when tuning is obtained by a substitution of the carburettor-body, provided the mounting on the inlet manifold continues to be done without any kind of intermediary device whatsoever. The substitution of an automatic control of the starter by a hand control (or vice-versa) is authorised. (5) Battery: the tension (voltage) as well as the location provided by the manufacturer may not be changed, but the make, type and capacity (amperage) are free as well as the shape, the dimensions and the attachment system. (6) Ignition coil, condenser and distributor: are free, on condition the ignition system remains as provided by the manufacturer for the considered model. A spare coil and/or a spare condenser may be set up anywhere provided the switching from main to spare cannot be controlled from the inside of the car. The replacement of an automatic control of the ignition by a hand control (or vice-versa) is authorised. (7) Plugs: same number per cylinder as provided by the manufacturer, make and type free. (8) Petrol pump: a mechanically controlled pump may be replaced by an electrically controlled one and vice-versa. (9) Reboring: is authorised on condition not to exceed the original bore by more than 0,6 mm. Moreover, the resulting increase in capacity must not be such as to make the car pass into the above class. The make of pistons is free as well as their basic material, but they shall be identical (except for their inner ribs) to those provided by the manufacturer for the model considered and shall have at least the same weight. In particular, the shape of the head, the location of the axis, the number and type of rings may not be modified. The type of ring is defined by the function for which it is intended: top ring, compression ring or oil cutter ring. When the engine has removable sleeves, the replacement of pistons is authorised in the same conditions as provided here above, that of the sleeves is also permitted provided the replacement sleeves are identical to the original ones and in particular their basic material is the same. Moreover, engines with removable sleeves shall enjoy the same re-boring tolerance as provided for sleeveless engines. (10) Muffler: the make and type are free, provided the noise-deadening efficiency is not affected and the exhaust manifold and particularly its outlet port is not modified. (11) Transmission: any manually or automatically controlled gearbox and any axle ratio provided and supplied by the manufacturer, mentioned in the maintenance booklet and on the recognition form may be used. The substitution of the clutch pedal by an automatically controlled one, regardless of its system of operation, is authorised. (12) Shock absorbers: the make and type are free but neither their number nor their system of operation, nor their system of attachment, may be modified. By system of operation is meant: hydraulic or friction shock-absorber, of telescopic or lever type, regardless of the mechanical resultants of these different systems, such as for instance whether the device has a double-acting or a simple-acting effect, and in case of hydraulic shock-absorbers whether there is or not an additional gas chamber. (13) Wheels: must be of a type provided by the manufacturer and stated on the recognition form. One basic series may comprehend wheels of different types (solid or perforated disc wheels, spoke wheels, etc.). The wheels, including their attachment system, may be reinforced, even if the strengthening entails a modification of said attachment system. Wheels may be balanced. (14) Tyres: the make and type are free but they must fit without any modification thereof on the original wheels and/or rims without the need of any intermediary device. (15) Brakes: any system improving the cooling or increasing the safety of the braking system is authorised, such as for instance the fitting of special air-pipes (provided the body as defined in Art. 258 is not altered). The fitting of a dual pump or any type of device providing both a simultaneous action on the four wheels and a divided action on the front and rear wheels is authorised. The make and attachment system of the linings is free. All the original supports and all the dimensions of inner friction surfaces shall remain unchanged. By original supports are meant those on which are fixed the mobile parts (drums or discs) and also the attachment system of the elements bearing the friction parts (brake-shoes or pad-linings). (16) Supplementary accessories: all accessories likely to improve the operation of the vehicle, the comfort of its passengers or the safety are authorised, provided they have no influence whatsoever on the mechanical performance of the engine, the transmissions, the road holding and the braking (except if explicitly authorised in this same article). (17) Coachwork elements (window, quilting, etc. ): The glass windows of the doors and the rear panel may be replaced by any other rigid and transparent material. The quilting may be changed and at inner coachwork accessories may be replaced by other ones or removed. (18) Bumpers, embellishers, stream-lining: The bumpers are compulsory except when the model is of a series normally delivered without bumpers by the manufacturer. Their shape is free, but their total weight (including the attachment parts) must be at least equivalent to that of the bumpers and attachment system provided by the manufacturer for the same model. However, for speed races on closed circuits, the supplementary regulations may authorise or prescribe the removal of the bumpers (in case of events comprising both a regularity course and classification tests on a closed circuit, the bumpers must be fitted on the car for driving on the open road). Embellishers and detachable hub caps liable to interfere with the changing of wheels may be removed beforehand if the entrant so wishes. The gain of weight thus obtained must of course be included in the tolerance of 5 % provided by Art. 260 here above. The addition of any protective stream-lining device not provided by the manufacturer for the considered series model is prohibited. However, for events run on particularly difficult ground (snow, sand, rutted tracks) the promoter, in his supplementary regulations, may generally authorise or even require the addition of a stream-lining appliance or any other underneath protective device. NB.—Any alteration or addition not explicitly authorised here-above will make the vehicle ineligible in Group 1, and will entail its assignment to whichever of the three other groups of the present regulations which applies. Any change or addition not listed above, and which has not been subject to a previous written statement of the entrant will entail a penalty which may go as far as exclusion from the competition without prejudice to higher penalties in case of willfull misrepresentation. All provisions of Chapter II concerning series Touring cars apply likewise to Group 2 cars, with the exception of third paragraph of Art. 257 concerning cars whose building has been abandoned since more than four years. (19) Wheels: may be of a different type than the one or those provided by the manufacturer provided the hub remains unchanged as well as the dimensions of the rim and of the track provided and stated by the manufacturer. (20) Reboring: authorised in the same conditions as for cars of the first group (of Art. 261-8), but with a maximum tolerance of 1.2 mm. (instead of 0,6). (21) Stabiliser: the fitting of a commercial suspension stabiliser or equivalent device is authorised, on condition it does not constitute an additional stay rod. (22) Oil filter: an oil filter may be added when the model provided by the manufacturer has none. (23) Springs of any kind (valves, clutch, suspension, etc. ): They may be replaced by other ones of unrestricted origin, but without modification of the number provided by the manufacturer and on condition they can be fitted without any alteration of the original supports. (24) Finishing off: all perfecting operations by finishing or machining the original parts but not their replacement except with regard to springs as specified here-above. In other words, provided it is always possible to ascertain unquestionably the origin of the series production part, it may be rectified, balanced, lightened, reduced or modified with regard to the shape through tooling, to the exclusion of any addition of material or any mechanical extension or of any process involving a change of the characteristics of the molecular structure or of the surface of the metal. The increase of the compression ratio through machining the cylinder head or block, or using a thinner gasket or doing without one, is authorised. (25) Braking: the braking power may be increased subject to the system of operation provided by the manufacturer (drum brakes or disc brakes) being maintained as well as the original supports (see Art 261, par. 15). NB.—Any alteration or addition not specifically provided here-above will make the vehicle unfit for classification in Group 2 and will result in its being affected to that of the two other groups of the present regulations which applies. Any alteration or addition not listed above and which has not been subject to a previous written statement of the entrant will entail a penalty which may go as far as exclusion from the competition without prejudice to higher penalties in case of wilfull misrepresentation. Grand touring cars are vehicles built in small series for customers who are looking for a better performance and/or a maximum comfort and are not particularly concerned about economy. Such cars shall conform to a model defined in a catalogue and be offered to the customers by the regular Sales Department of the manufacturer. They must be recognised by the F.I.A. according to the provisions of Art. 265 below. (a) either the original one when it has been subject to any kind of alteration in shape or appearance (other than one due to a latitude granted under 261 or 263) or to an alteration of the material used by the manufacturer. 1. if the chassis is of self-bearing type, it shall be maintained and may be strengthened, but not lightened or cut. 2. if the chassis is not of self-bearing type, that is when the car has no chassis or only a partial or insufficiently bearing one, the body may be changed as a whole, but shall under its new shape compulsorily use the original attachment points on the series production elements of the suspension, propulsion and steering. Shall also be classified in the same Group 3, Touring Cars equipped with their standard coachwork, but having been subject to changes or additions not authorised by Art. 261 and 263 above and whose limits are stated hereafter under Art, 274 (b). In order to enjoy recognition in the “Grand Touring’' category cars will have to be produced at a minimum rate of one hundred identical units as far as mechanical parts and coachwork are concerned in 12 consecutive months. The word “identical” has the same meaning as defined under Art, 257, par. 4. However, one same minimum series of 100 units may have two different carburettor equipments either in number or size. Moreover, cars will have to conform to specifications of Art. 266-270 below. All parts of the chassis shall be at least 12 cm. from the ground, so that a mass 80 cm. wide and 12 cm. high may be introduced between the back wheels and through the length of the car. This ground clearance may be measured with empty tank and nobody in the car, which must be equipped with the wheels and tyres that are to be used in competition. The maximum lock shall be 6.75 m., which means that the car must be able to make a complete turn in any direction without the wheels going beyond two parallel lines 13.50 m. apart, drawn on the ground. Grand Touring cars shall have to be equipped with a starting device liable of being operated by the driver when aboard. Grand Touring cars shall have one of the fuel tanks provided by the manufacturer and the capacities of said tanks shall be entered on the recognition form. Grand Touring series cars shall be equipped with a coachwork enabling a normal touring use, in particular as concerns comfort, habitability and protection against bad weather. Coachwork shall be completely finished without any provisional part. It shall offer at least two seats located on either side of the longitudinal axis of the car at the same level without prejudicing the normal system of adapting the seat to the size of the pilot. The minimum inside width shall be 100 cm for cars with an engine cylinder capacity of 1000 cc. or less, and 110 cm. for cars of a higher capacity. This width, measured perpendicularly to the longitudinal axis of the car must be respected along a minimum height of 25 cm. and a minimum depth of 30 cm, measured on the vertical plane tangent to the back of the steering wheel and the back of the seat (i.e. at the normal place where the driver needs elbow-room). The passenger’s space shall remain available through the whole event. It shall not be either totally or partly covered and shall offer the same conditions of comfort, habitability and protection as that of the driver. However, supplementary regulations may provide for the covering of the passenger's seat with canvas or any other similar supple material, which can be quickly removed by hand without any tool. Under no condition whatever may the seat be used for a spare wheel or be combined with the fuel tank(s). The latter shall be located outside the cabin so as to protect its occupant from fumes and direct fuel splashing. Transmission equipment (shafts and cardan joints) shall be placed under the floor boards or in tubes or casings. Floor boards, tubes and casings shall be permanent fixtures, properly joined together and firmly fixed to the coachwork or the chassis. As concerns the location of the seats in relation to the pedals it shall answer the minimum specifications of Art. 259 for Touring cars. The height under the roof or hood measured In the middle of the driver's seat from the lowest part of the cushion shall be 85 cm. minimum. The windshield is compulsory. It shall be placed symmetrically in relation to the axis of the car and be equipped with at least one automatic wiper placed before the driver and wiping a sufficient surface to enable the driver to see distinctly the road from his seat. 90 cm. for cars with an engine capacity inferior or equal to 1000 cc. 100 cm. for cars with an engine capacity exceeding 1000 cc. 25 cm. measured vertically and carried through the whole minimum width. Furthermore, the distance between the top edge of the windshield and the lower point of the front-seat cushions shall be 80cm minimum measured, vertically at all points of the minimum width. Mudguards shall be of permanent nature and firmly fixed. They shall be placed exactly above the wheels and provide efficient covering of at least one-third of their circumference. The width of the mudguards shall be such that no part of the tyre will pass beyond its edge when the wheels are not steered. In those cars where mudguards are entirely or partly overhung by the body structure, the combination mudguards-body or the body alone shall nevertheless meet the above protection requirements. The back extremities of the front and rear mudguards shall come down at least to the horizontal plane passing through the centre of the wheel hubcap. Mudguards turning with the wheels are prohibited. They must be solid with the body, there being no gap between them. Open or convertible cars shall be equipped with at hood fitting hermetically the windshield, the windows or the side panels and the back of the coachwork. The hood shall never interfere with the opening of the doors. Its back panel shall be entirely closed and shall offer a transparent section, providing good visibility behind, of the following minimum dimensions: width, 50 cm, height 10 cm—measured vertically. It may be used partially or permanently during the event, according to the provisions of the Supplementary Regulations. The hood may be replaced by a removable hard top, but at scrutineering cars must be presented with one or other. All vehicles shall be fitted with at least one rigid door on each side with lock and hinges, giving direct access to seats. When open it shall liberate a space allowing for the frontal passage of a 50x30 cm rectangle. Vehicles with a front or rear door may have only one door. Cars with closed or convertible coachwork shall have doors equipped with security glass or transparent rigid plastic material, providing ventilation, each window having a minimum width of 40 cm and a minimum height of 25 cm. It shall let the light through a minimum width of 50 cm and a minimum height (for the whole minimum width) of 10 cm vertically measured. A covered space being an integral part of the coachwork but outside of the space occupied by the front seats, large enough to receive a trunk of 65x40x20 cm minimum, besides the spare wheel, tools or the folded hood, shall be provided. Open or closed special bodies built in supplement to those required for the recognition of the car according to Art. 265 above shall be admitted if they meet the specification of Art. 264 (b) and Art. 270 above, provided the weight of the vehicle remains at least equal to that of the corresponding recognised car (with the same tolerance of minus 5%). Once there is an existing series of 100 units built within twelve consecutive months, offering the standard body and duly recognised, no minimum of construction is further required for a special body whether mounted by the manufacturer or by the entrant. The weight of a Grand Touring car shall be entered on the recognition form of the model under consideration. It shall be obtained in the conditions specified under 260. When the weight is being checked, a tolerance of 5% less than the weight entered on the recognition form will be granted. All additional equipment and modifications authorised for series production Touring cars (group 1) and improved Touring cars (group 2) are authorised for Grand Touring cars (group 3) in particular all those listed in Articles 261 and 263. Any Grand Touring car with extra equipment or subject to any modification not explicitly authorised may take part in a competition only in group 4, as defined hereafter at Art 275, and subject to said group being provided in the Supplementary Regulations. N.B.—Any alteration or addition not explicitly authorised here-above will entail the vehicle ineligible in group 3 and will entail its assignment to group 4 (see Art. 275 hereafter). Any change or addition not listed above and which has not been subject to a previous written statement of the entrant will entail a penalty which may go as far as exclusion from the competition without prejudice to higher penalties in case of wilful misrepresentation. Touring cars of a model recognised by the FIA equipped with special coachwork, as defined in Art. 270 above, but in conformity with regard to mechanism with the series production model, except for changes and additions authorised according to Arts 261 and 263, shall be assimilated to Grand Touring cars and may participate in events in group 3. If the above cars are subject to changes and additions exceeding the limits provided under Arts. 261 and 263, they shall pass into group 4, and will then be subject to no further obligation apart from having to comply with the requirements of Appendix C to the International Sporting Code. Shall also be assimilated to Grand Touring cars, Touring cars of an FIA recognised model equipped with their original coachwork but which have been subject to alterations and additions other than those authorised according to Arts. 261 and 263, and made either by the manufacturer or the competitor with the intention of increasing the performance and improving the conditions of use of the vehicle. The reboring of the engine, whether sleeveless or fitted with sleeves, is authorised up to the limit of the class to which belongs the car according to its original cylinder capacity. Furthermore, in consideration of the trend of technical evolution, and the necessity of increasing the safety of cars whose high performances had not been initially foreseen by the manufacturer, the improvement of the braking may be sought without any obligation of maintaining the original system; drum brakes may therefore be replaced by disc brakes. 4. Gearbox and rear axle box, which may be subject to minor alterations to enable the modification of the gear box ratios or the mounting of an overdrive. The minimum weight must be that entered on the recognition form of the corresponding series production touring car, but the tolerance granted when the weight is checked will be minus 10% (instead of minus 5%). The addition of compressors, blowers or any kind of supercharging device not provided in the series production and entered on the recognition form remains prohibited on cars of this group. NB.—Any omission or wrong information on the above-mentioned statement will entail a sanction which may go as far as excluding the car from the competition without prejudice to higher penalties in case of wilful misrepresentation. (1) All Touring and Grand Touring cars of a model recognised by the FIA, but not complying with the specifications required for classification in one of the groups from 1 to 3. In that case they must comply with the provisions of Art. 266 to 270. Cars deriving from a model recognised in the Touring category but assimilated to sports cars on account of alterations exceeding the limits consistent with classification in one of the three preceding groups are not, however, when they compete in regularity trials subject to the specifications of Art. 266 (minimum ground clearance) or of Art. 267 (maximum lock). (2) All cars which are not of a recognised model but which comply with the specifications of Appendix “C” to the International Sporting Code. They shall, however, not allow such cars to compete in any one of the four groups listed under Art. 252.